Let’s just put it quite simple, portable vaporizers are another way for smoking medical cannabis and many cannabis patients find it gives them a smoother effect than smoking the weed outright from a joint. There is no other way around explaining it than to just give it to you straight. For that reason, many medical cannabis patients are seeking which vaporizer is the best on the cannabis market. Do you know? Get the real scoop at the Cannabis Training University. Anyway, if you are a vape smoker, you may know, but either way, it is essential to discuss the benefits and effects of portable vaporizers first. What is a vaporizer? It is a device that is battery operated and used with weed, wax, or cannabis oil to produce vapor looking like smoke. You don’t smell the weed as much as when smoking medical cannabis from a vaporizer as you would in smoking the joint. Smoking medical cannabis from a vape pen is usually done for both recreational and medicinal purposes as long as it is legal. How Does The Portable Vaporizer Device Work? Portable vaporizers come with a heating component and tank, which stores the wax, cannabis oil or herb. The tank is the storage part of the device. The herb or oil in the tank comes in contact with the heating component, heats up and then turns itself into vapor. The cannabis patient would then inhale the vapor. So, instead of saying that you are smoking medical cannabis; people would say you are vaping. Is It Legal To Vape with a Portable Vaporizer? As long as medical marijuana or recreational marijuana is legal in your state, you can use a vaporizer. However, you can only use portable vaporizers if you are over the age of 18 and you can vape in public places. So, those are the main restrictions, even in a state where marijuana has been legalized. There are three main types of vaporizers for smoking medical cannabis and recreational marijuana. 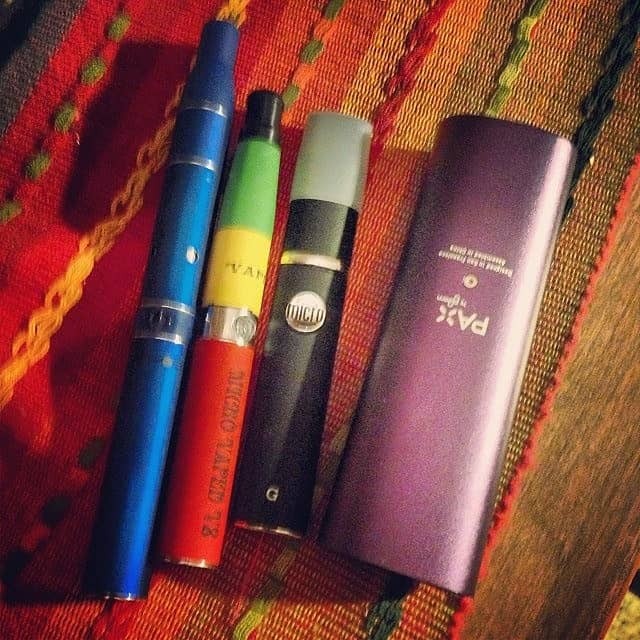 These are namely vape pens, portable vaporizers and desktop vaporizers. You can buy them in a pot shop or marijuana dispensary where it is legal. When smoking medical cannabis, you will notice a light smell, but not the harsh smell as you get from a joint. There is absolutely no short term side effects associated with using a vaporizer for vaping or smoking medical cannabis. It is not known yet, if there are any long term effects, but it appears not, but you should always do your own research. Portable vaporizers are not similar to bongs. With a bong, combustion is the process by which you smoke the herb and with this method, harmful toxins are released as in cigarette smoking. The ideal temperature for your vaporizer is dependent on the type of vaporizer that you are using. It is safe to say that portable vaporizers usually perform better at a temperature between 330 and 420 degrees Fahrenheit. For the best vaping results, you should grind the herb at its finest state. The herb now has smaller particles, which makes it easier for the heat to go through, producing a crisper flavor and a noticeable smoothness when you vape. In addition, the herb will be vaped thoroughly instead of wasting your herb. For $150, you can get the MigVapor Matrix and for $1629, the V2Pro Series 7 vaporizers, which are both portable vaporizers. They are both worth the price. However, for even better options, you have the DaVinci Portable Vaporizer for $200. You could try a desktop vaporizer like Da Buddha for just $190. The Silver Surfer is at a little less than $210. For vaporizer that can accommodate dry weed, wax and hash oil is the Series 3. You will need extra cartridges to be able to use each of these materials in this three in one portable vaporizer. The V2 Series 3 is the best for traveling. It is easy to use and more durable. If you want to learn more about portable vaporizers, visit the Cannabis Training University today.